Serving adult and pediatric patients, Erlanger Dermatology offers comprehensive treatment for a variety of skin conditions. Our physicians are well respected in their field having been cited and/or published in the Journal of the American Academy of Dermatology and JAMA Dermatology. Additionally, they have been invited to speak on numerous occasions for various universities, the annual American Academy of Dermatology meeting, as well as the Tennessee Dermatology Society. In addition to the treatment of a variety of different skin, hair, and nail conditions, Erlanger Dermatology also offers many cosmetic procedures. We offer the latest in laser procedures for face and body rejuvenation, dermal fillers, medical facial peels, and many other services. 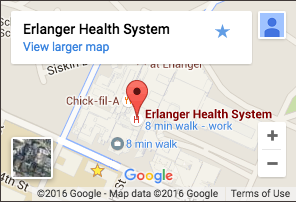 For more information or to make an appointment with Erlanger Dermatology, please call 423-778-5693.